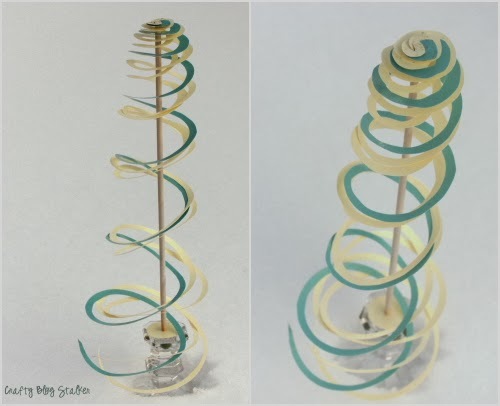 A spiral cut paper tree makes a fun Christmas decoration for winter or any time of year. Easy DIY craft tutorial idea that takes minutes and looks great! This is a sponsored post on behalf of Die Cuts with a View. All opinions are 100% my own. This Spiral Cut Christmas Tree is one of my favorite new ways to decorate for the holidays. This beautiful Christmas decoration took less than 30 minutes to create. You can make it in just about any size AND it can be left up all winter long! Die Cuts with a View completely inspired this fun little project. I was so excited to get a fun package delivered to my door. 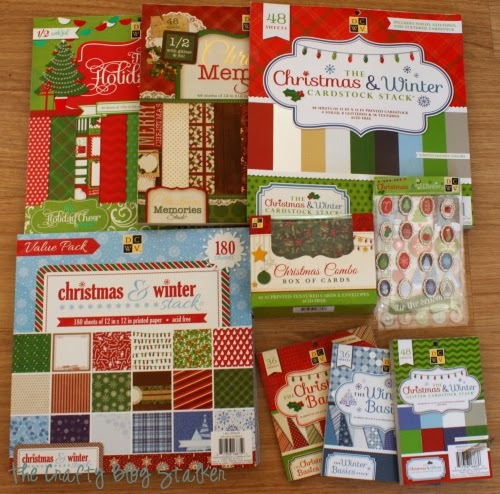 They sent me all sorts of fun paper goodies and I couldn’t wait to dive in and get crafty. 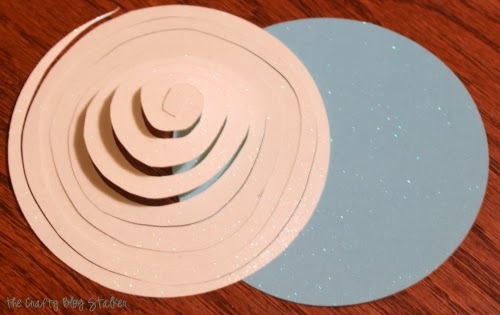 I used a total of 3 sheets, 2 Glitter White and 1 Glitter Blue and cut a 4-inch circle out of each piece. 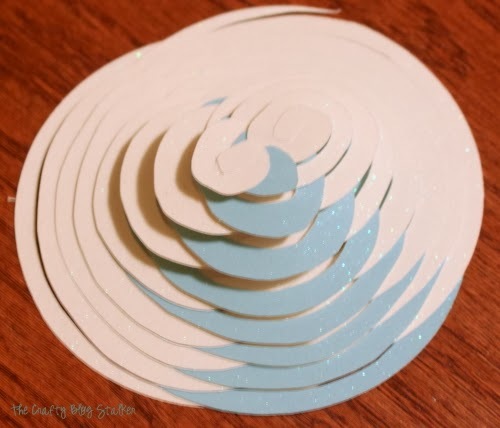 Start on one edge of a white circle and cut around the edge in a circular direction until you get to the center with a spiral cut. Try to keep my circles even as you go around, but they don’t need to be perfect. When all 3 circles are spiral cut, stack them together as shown below. 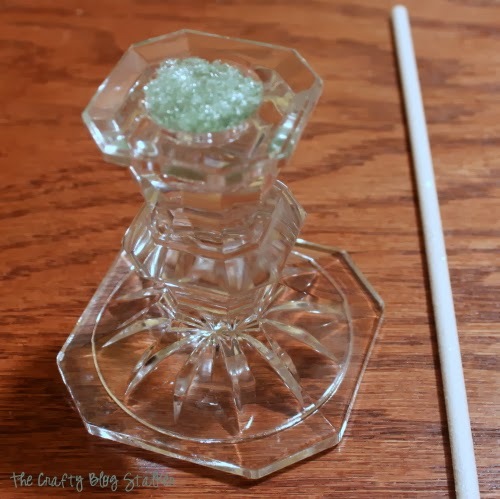 For the base of the tree, use a glass candle holder and a dowel. Spray paint the dowel white before you assemble all of the pieces together. Cut a small corner of floral foam and push into the opening of the candlestick. You don’t need to glue the foam in so the candle holder can be reused. 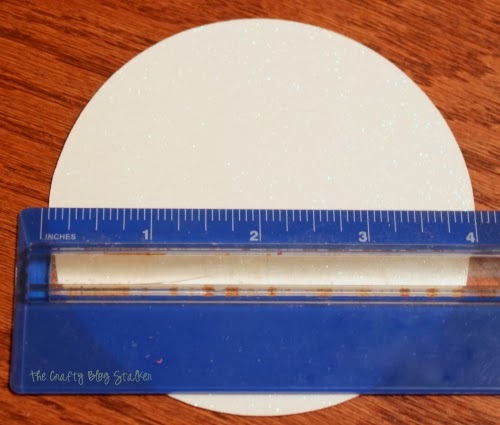 To make it just a little bit more sturdy cut a circle out of a scrap of White Glitter Cardstock that will fit over the top of the candle holder and punch a smaller circle in the center that the dowel will fit into. 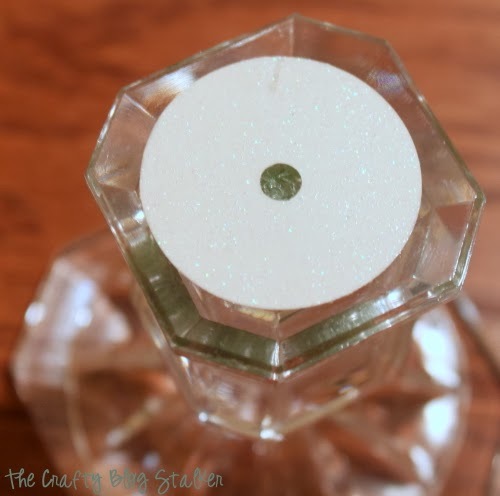 Use a glue dot to adhere the circle to the rim of the candle holder. This will help keep the dowel straight and in place without ruining the candle holder. Put the dowel into the candle holder and put the spiral cut circles on the top with the very centers of the circle on the top of the dowel. Yep, it really is that easy! You could easily make fatter trees using a bigger circle and cutting around the circle in fatter strips. 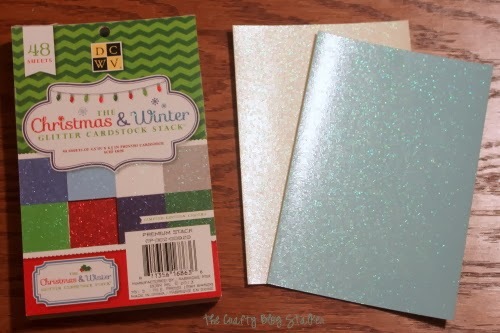 I wish you could see the Glitter Cardstock sparkle better in the pictures because it really does add that touch of winter snow. Do you have a favorite handmade Christmas decoration? Share and leave a comment below. SAVE HOW TO MAKE A SPIRAL CUT PAPER TREE TO YOUR FAVORITE DIY PINTEREST BOARD! Hi Katie, Love it!!! Not a lot needed to make this beautiful tree!!! I think if you used nice scrapbook paper, you could make it even bigger and have a few different sizes!!! Simple and beautiful, Thank you!!! Have a fab day!!! You could get so creative with these! What a fun project! These are so fun! Thanks for sharing on the weekend re-Treat link party! Hope to see you again Thursday at 7PM. I’m totally in love with this! So cool! Pinned and tweeted. We appreciate you being a part of our party, and I hope to see you on tonight at 7 pm. We love partying with you!